Timothy Wilkinson was born in 1957 in Corry, Pennsylvania. He enlisted in the U.S. Air Force on January 6, 1981, and was trained as a Missile System Analyst Specialist. Wilkinson's first assignment was as a technical training instructor at Chanute AFB, Illinois, where he served from April 1981 to November 1984. He then cross-trained into the Pararescue career field, and served with the 71st Aerospace Rescue Recovery Squadron and then the 1730th Pararescue Squadron, both at Elmendorf AFB, Alaska, until November 1988. 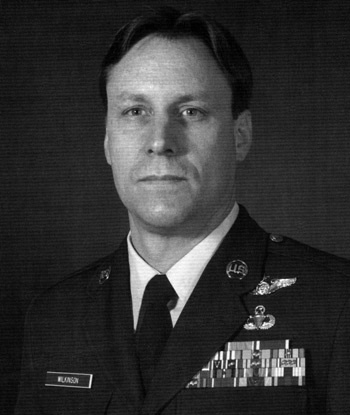 Sgt Wilkinson then served with the 1724th Special Tactics Squadron at Pope AFB, North Carolina, from November 1988 to September 1996. During this time, he participated in Operation Just Cause in Panama, the Battle of Mogadishu in Somalia, and Operation Uphold Democracy in Haiti. In September 1996, Sgt Wilkinson transferred to the 720th Special Tactics Group at Hurlburt Field, Florida, where he served until his retirement from the Air Force on September 30, 2001. 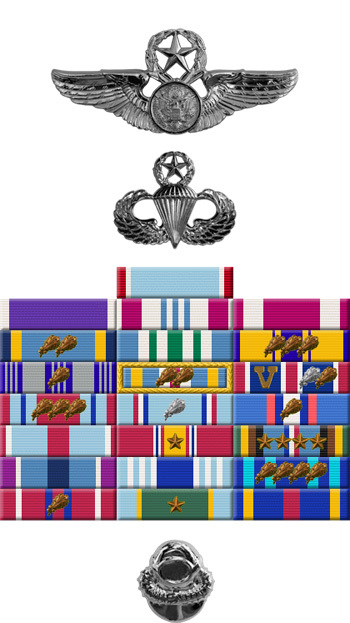 The President of the United States of America, authorized by Section 8742, Title 10, United States Code, awards the Air Force Cross to Technical Sergeant Timothy A. Wilkinson for extraordinary heroism in military operations against an opposing armed force as a 24th Special Tactics Squadron Pararescueman in the vicinity of the Olympic Hotel, Mogadishu, Somalia, from 3 October 1993 to 4 October 1993. During that period, in response to an incident in which a United States helicopter had been shot down by a rocket propelled grenade, Sergeant Wilkinson conducted a fast rope insertion into the crash site and came under extremely heavy enemy fire from three directions. In the initial rescue effort, he repeatedly exposed himself to intense small arms fire and grenades to clear debris, provide emergency medical treatment to the survivors, and extract dead and wounded members of the crew from the wreckage. On his own initiative, Sergeant Wilkinson broke cover on three separate occasions to locate and provide emergeny medical treatment to three Ranger casualties. In doing so, he ignored all concern for his personal safety to cross a 45 meter-wide open area blanketed with intense fire from small arms, and rocket propelled grenades. Sergeant Wilkinson's medical skills and uncommon valor saved the lives of multiple gravely wounded American soldiers in the longest sustained fire fight involving United States combat forces in over 20 years. Through his extraordinary heroism, superb airmanship, and aggressiveness in the face of the enemy, Sergeant Wilkinson reflected the highest credit upon himself and the United States Air Force.